Color: White, Size: 32 fl. oz., Approx. Coverage: 100 sq. ft.
Approx. Coverage per Quart: 100 sq. ft.
*Note: Coating requires no primer when used directly on CSM, PVC or vinyl. For optimum performance, two (2) coats are recommended. 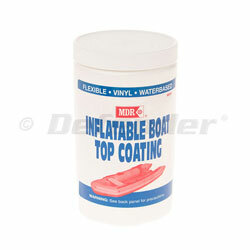 Inflate boat to normal operating pressure before applying Top Coating. Color: Gray, Size: 32 fl. oz., Approx. Coverage: 100 sq. ft.